Dolls House Wooden Mia Casa is a beautifully made, well designed, open plan Dolls House from Le Toy Van complete with 15 pieces of solid furniture and one wooden doll. This two storey house has a pretty pink roof supported by four natural wooden poles. The ground floor and the second storey floor are different colours and nicely shaped. The dolls house open plan design means it can be played with from all sides, making it possible for more than one child to play at a time. It also makes it easy to arrange the furniture and dolls. 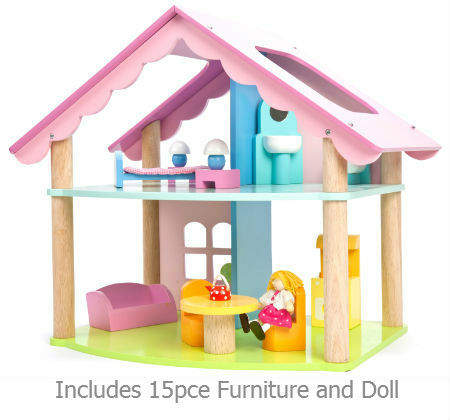 This dolls house comes with four rooms of lovely furniture. A Bathroom with sink and toilet. Bedroom with a single bed, soft mattress, tables and lamps. Kitchen with stove, table chairs and a kettle. Living room with sofa and table. This is a wonderful toy with a simple, elegant design that is wonderful to play with and looks lovely in your little ones bedroom. Size: 52cm long x 45cm high x 35 deep. We like this because: "Beautiful design and we particularly like the little kettle."